Are you intending to renew your motor vehicle license any time soon? If your answer is yes, your search for a reliable insurer is over, and you will also get rewarded for it! 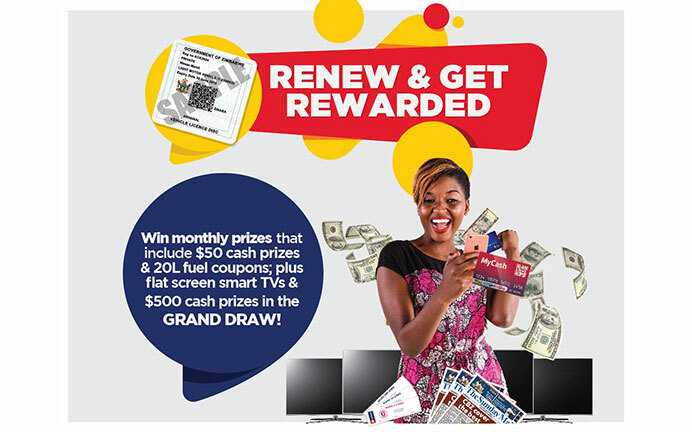 And that’s not all, on top of all this, CBZ Insurance will be giving away loads of monthly prizes that include $50 cash prizes and 20 litre fuel coupons monthly, plus $500 cash prizes and Smart TV sets in the grand draw to be held on December 14 2018. Employees of CBZ Holdings and its respective subsidiaries are not eligible to participate in the Monthly and Grand Draws. Both 3rd party and comprehensive motor renewals are eligible for the promotion. 20 Litre fuel coupons will be petrol/blend for the Monthly Draws. Airtime benefit is for local networks only (econet, telecel, netone). All non-monetary prizes cannot be exchanged for cash. For more information on the “Renew & Get Rewarded Promotion”, contact the CBZ 24-hour Contact Centre on Facebook, Twitter, WhatsApp (+263 774 460 460, +263 774 461 461), Email ([email protected]) or simply dial our toll free lines 460/461. Be the first to find out about our promotions.